Win £250 of National Book Tokens for your Chatterbooks group! Do you run a Chatterbooks group in your library or school? Would you like to take the children in your group on an even bigger reading adventure? Perhaps you’d like to buy new books for the library for all the children to share, or run your own competition for the young readers in your group. 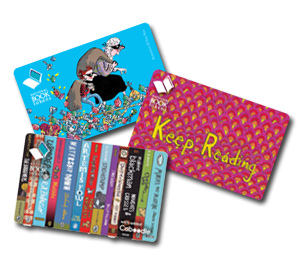 Or maybe you’d love to just give them the gift of choice – their own National Book Token to start their next reading journey. At National Book Tokens, we believe that choosing a book is an adventure in itself. National Book Tokens can be bought and spent in bookshops everywhere, from big chains to small independents. Where will they take you? Kate’s entry won us over with her exciting plans to use the prize to take her Chatterbooks group on a real-life National Book Tokens adventure – a shopping trip to buy new books for the school library! She won a £250 National Book Token to do just that. Closing date is 11:59pm on 28th February 2019. The main winner and two runners-up will be selected within 7 working days after the end of the competition by a panel of judges from National Book Tokens and at least one independent judge. We will contact winners by email. In the event of a winner not responding after 5 days, we reserve the right to allocate the prize to another winner. The competition is open to UK residents aged 18 and over who run, coordinate or volunteer for a Chatterbooks group, except for employees of The Reading Agency, employees of the Booksellers Association and Book Tokens Ltd. and employees of participating bookshops.